Why do People Whistle ~ Are They Just That Happy? I’m going to come clean right off and confess that I can’t whistle. And I don’t mean I can’t whistle in the sense that I can’t carry a recognizable tune, I mean I CAN’T WHISTLE. As the daughter, spouse and mother of prolific and proficient whistlers, it seems I have spent my entire life trying to master making one single, short, solitary sound. So maybe I’m just a little envious of the people who can turn their breath and two pursed lips into a beautiful melody. Still, I wonder, why do people whistle? 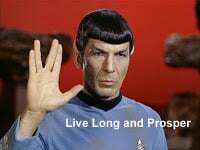 Is being able to whistle just some genetic oddity like tongue rolling or webbed toes, or a mastered skill like being able to raise one’s hand in the Vulcan split-fingered salute. I ventured to the internet in search of an answer but was unable to find any concrete scientific evidence to show that whistling was, in fact, a genetic trait, which sort of miffs me. It just has to be! I figured because many people can whistle so easily, even small children, that if I can’t do it then I must have some genetic predisposition that prohibits me from whistling. That’s my story, and I’m sticking to it. But what is it about whistling that causes people to love it, tolerate it, or hate it? You rarely ever hear of people whistling when they’re sad, so I ask this; why do people whistle? Are whistlers so insanely happy that they have some overly elevated level of joy? So much so that it bubbles up and spills out in the form of air molecules passing over the tongue and through their lips? There are those of us that can’t whistle or who are terrible at whistling, but to those of you who can, I ask, how in the world do you intuitively know which are the correct sounds to create the correct “notes” in the tune you are whistling? Movies, musicals, TV shows, and recorded music are all filled with whistles. Some very famous movie whistling scenes and songs are Whistle a Happy Tune from the King and I, 1944’s To Have and Have Not, 1957’s Bridge on the River Kwai, Kill Bill in 2003, and countless others. Whistling also runs rampant in Disney movies. Pinocchio (That boy is more representative of my talent! ), Song of the South, and who can forget Snow White and the 7 Dwarfs whistling while they were going off to work, and those adorable forest creatures whistling while they worked. This brings us to another topic. Every office has one… or two, or three; the office whistler. And depending on how you feel about those whistlers and their ability to carry a tune, whistling at work can divide a workplace into factions. To some, it’s like nails on a chalkboard while others hardly give it a thought. Some argue that in an office setting, after a while everyone’s habits become annoying. 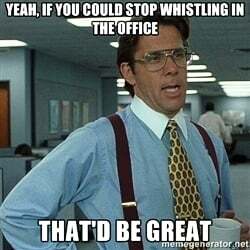 Some coworkers drum on their desk, many talks to themselves, (Ummm that might just be me) and others produce all manner of annoyingly audible cubicle noises, but it’s the whistlers who really set people off. There are all kinds; the out of tune Whistler, the random Whistler or everyone’s favorite, the constant non-melodic whistler. Whistling that doesn’t go anywhere or sound like anything recognizable, but continues almost non-stop, all day long. Maybe like nail-biting, it’s just a habit they can’t break. If you’re an anti-whistler type, short of duct tape, how can you keep your focus when Tweety Bird starts up? We once again ventured to the internet for an answer, but this time came up with some suggestions. One anti-whistler proposed whistling along with them to make them aware of what they are doing. (This wouldn’t help us non-whistler types). Others suggest just telling them to eliminate that habit from their repertoire. The best suggestion we saw was to arrange portable partitions around the annoying whistler to dampen the sound emanating from Tweety Bird. While I don’t mind the occasional encounter with a whistler, I was intrigued by the use of these rolling walls. After calling Screenflex Portable Room Dividers, we learned that these fabric walls absorb up to 65% of the sound. Perhaps these are the versatile solution we non-whistler types should employ in our offices. Perhaps those souls who have this uncontrollable, irrepressible urge to whistle (not that I’m jealous or anything) should channel all of that energy into becoming a whistling champion, or maybe lend their talents to the recording industry. And finally, I’m not exactly certain how the whistlers among us will feel about this, but in an odd bit of news, researchers have recently discovered some primates have spontaneously mastered the ability to whistle. We’d love to hear from you. Tell us how you feel about whistling (whistlers and non-whistlers alike!) and share your whistling stories. Have you tried whistling alongside them or have you used portable walls to dampen the sound in your office? We’d love to hear your suggestions.